-Where will GOOG close at the end of 2007? 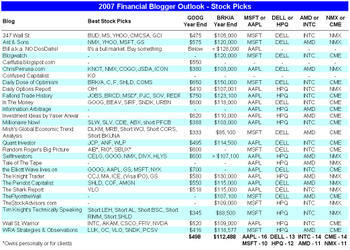 -Where will BRK/A close at the end of 2007? -Which stock will perform better: MSFT or AAPL, DELL or HPQ, AMD or INTC, and NMX or CME? The expected change in 2007 for GOOG based on our survey is 7.60% ($498 price target), and the average change for Berkshire (BRK/A) is -0.85% ($112,488 price target). In our head to head competitions, AAPL is expected to perform better than MSFT, DELL edges out HPQ, INTC beats AMD, and CME beats NMX. Please see the table below for individual answers. As always, we thank all of our participants for contributing. Check back soon for Part 3 of our Outlook for economic, oil, and home price expectations in 2007. Good to know more about stock picks and its related ares. I think it can be more informative..
Good to know more about stock picks and its related areas.. i think it can be more informative.. Among the verity of blogs your written blog is unique one.This is appreciated. It is very nice and interesting. I believe with GOOG's continued expansion into the mobile market it will rise far ahead of expectations...if that is even possible at this point. Great read.